Interests - Bob the builder, reading, jigsaw puzzles, nursery, reading, colouring in, Peppa Pig and 'Cars' the movie. 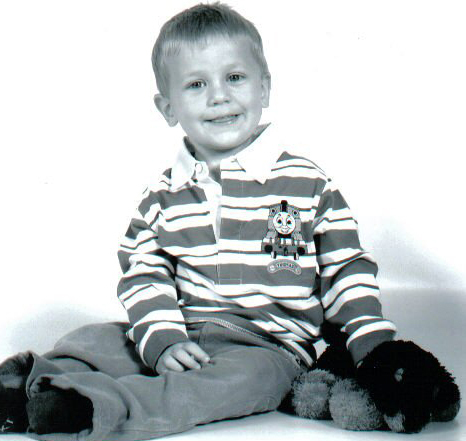 Toby was diagnosed with Stage 4 Neuroblastoma in September 2003. He was treated at the John Radcliffe Hospital in Oxford and had 6 months of chemo followed by surgery to removed the tumour in March 2004 when he was 13 months old. Due to the spinal cord compression caused by the tumour, Toby now has problems with his bladder and bowel and also has lower leg weakness, which means he has to use a little frame to get about. He has just had surgery to put his hip back in its socket and was in a hip spica cast for 4 weeks. He also had some tendons removed in his right foot to help it stand flatter – again due to nerve damage. Toby has a big brother called Sam who is 7. He has had a lot to put up with since Toby was first diagnosed – this happened a day after Sam first started school. He is a lovely boy though and very thoughtful and looks after Toby very well! Although some days they do fight like cat and dog!! All in all Toby is a fantastic little boy who doesn’t let his disabilities get him down. He always has a cheeky smile on his face and manages to wrap any nurse around his little finger! Toby remains well so we are “moving on” from Post Pals. Thank you to everyone who has written to Toby and Sam. The children are getting very excited about Christmas! Thank you for all the cards this month, we have had quite a few from abroad! Toby is doing brilliantly, he is now walking without his frame (although still a little wobbly!) He has 3 visits to Oxford this month for his MRI scan on 13th, Urology dept on 11th and then Oncology clinic for results of the MRI on 26th Oct.
Toby has had the “all clear” from his oncologist in Oxford who has said that it is now highly unlikely that the Neuroblastoma will return – yay! Many thanks to the Post Pals team; it really is a great thing to do. We got the results today from Toby’s MRI scan last week and they are brilliant – No Evidence of Disease!!! We are over the moon! This is now 2 years in remission from Stage 4 Infantile Neuroblastoma. He also had a good appointment with Orthopeadics and after having an Xray which showed that the pelvis and hip have healed properly, he said that we don’t need to see him for another 3 months. When we go then we will speak to the consultant about Toby’s spine as he does have a slight curvature in it, just so we know when to expect anything to happen regarding that. Then we went to The John Radcliffe for his Urology appointment and the consultant again was very happy with how Toby had been doing, I have to do some studies on him to see how much he is weeing in his nappy, then to sit him on his potty and then to catheterise him and see how much he has left in his bladder – so it is all a bit of a fiddle but it will mean we will have a better idea of what’s going on. Apparently, bladders can shrink back to a normal size so we are hoping that this has begun to happen now. So all in all a fantastic day – I cannot believe it!! !